On an Island where seafood is king, Mike Santoro created a kingdom. As a Vineyard resident for 23 years, Mike’s knowledge of both local and off-Island clientele gives him unmatched insight into the world of both food and people. 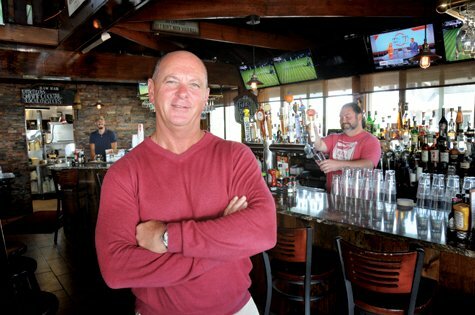 Mike is the founder of Santoro Hospitality Group, which owns three of Oak Bluffs’ most popular restaurants: The Lookout Tavern, Fishbones and the Oceanview. Each brings its own unique flavor to the table. Mike’s credo of fresh and local seafood, consistent menus and exceptional service guide the dining experience at all three establishments. And at one - The Lookout Tavern - diners can enjoy the view of the ferries along with the cuisine from a perch near the Oak Bluffs steamship terminal. In its 19 years, the Lookout Tavern boasts some of the best sushi on the Vineyard - an opinion shared by Islanders and visitors alike. The Lookout remains open nine months of the year. Opened in 2014, Fishbones is a perfect place to people watch. Expect the food to have a blend of delights from the sea with an added Caribbean flare. With delightful drinks served directly on the wharf, what more could you ask for on a summer day or evening right on Oak Bluffs harborfront? The newest addition to Santoro Hospitality was the 2015 purchase of the Oceanview, originally owned by the Jackson family. With strong customer loyalty, the Oceanview features steaks, chops, seafood and pasta - all served in a homey atmosphere. Destined for renovations this winter, Santoro plans to update the restaurant while maintaining the familiarity Islanders have come to expect. “The Oceanview has something for everyone,” says Mike. Mike is a man not only charged with the quality of his restaurants but also to the care of Oak Bluffs. As chairman of the Oak Bluffs’ selectmen, he’s dedicated to “bringing beauty back to Oak Bluffs. Always mindful of attracting new customers to his eateries, Mike frequently offers promotions and specials each week to keep the presentations fresh and lively. Decide what kind of menu and ambience you desire and surely you will find one of Mike Santoro’s restaurants to your liking.